Sample: Clarins Double Serum & Multi-Active Day – I am a big fan of Clarins oils and serums, so I’m wasn’t surprised to find that I really liked the Double Serum. It was scented but didn’t irritate the skin, was absorbed quickly and left my face looking nice and plump the next day. 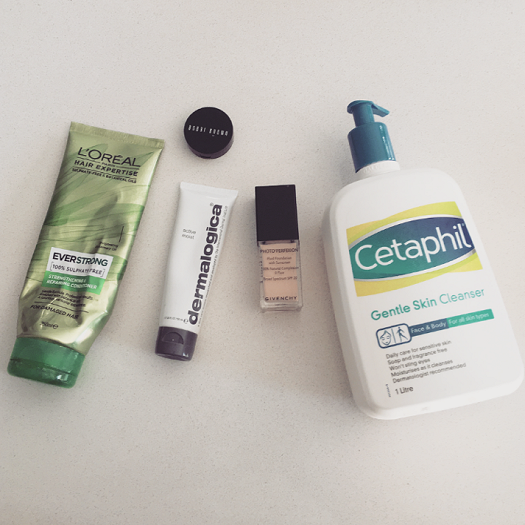 The Multi-Active Day cream was not my favourite, it was heavily scented (enough for me to still smell it for a long time after applying it to my face) and too heavy for me to wear as a day cream. I would consider picking up the full sized serum, but not the day cream. 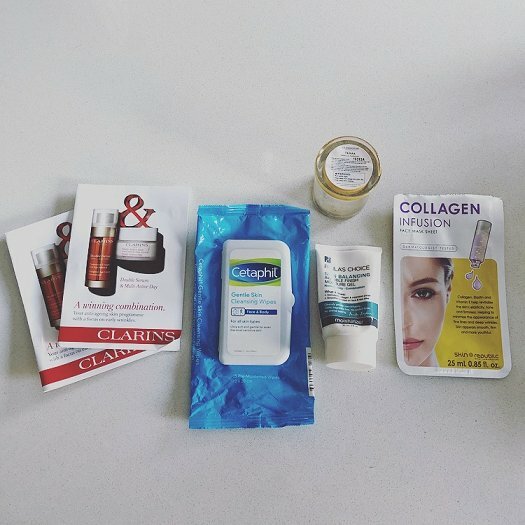 32: Cetaphil Gentle Skin Cleansing Wipes – This product is a new discovery for me this year and now a firm favourite in my skincare cupboard. Unfortunately, due to the fact that I am trying to finish this damn Project Pan I have not been able to repurchase. But you can bet that when I’m next in a position to be buying face wipes this is what I’ll be picking up. 33: Glasshouse Candle in Tahaa (vanilla caramel) – To be honest, I’m not a big fan of this scent because it’s too close to being sickly sweet. It is however one of Sebastian’s favourites and I purchased this mini candle as part of his Christmas gift last year. I wouldn’t repurchase this for myself, but he loves it so it might still make a reappearance in the future. 34: Paula’s Choice Skin Balancing Invisible Finish Moisture Gel – Um, what?! A Paula’s Choice product that I didn’t repurchase immediately? It is only because I am participating in this pan that I didn’t repurchase this. I loved this moisturiser, and it has replaced Hydralight as my favourite in the range. This has more of a gel-like texture, and my combination skin absolutely loved it. I think this would work well in the warmer months because it feels nice and light on the skin. 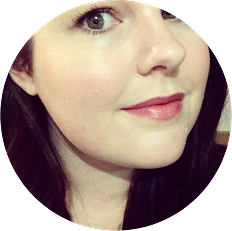 35: Skin Republic Collagen Infusion Face Mask Sheet – I picked up a couple of these sheet masks while placing a Chemist Warehouse order not really expecting much but I actually really love them. They work well on my sensitive skin, and do seem to have visible results. I am leaning more and more towards sheet masks lately, they really play into my laziness. They’re so easy to use and I don’t have to spend any time washing any additional product off my face afterwards. These masks in particular are only $6.99 and are definitely worth checking out. 28: Woodwick Candle in Campfire Marshmallow – This is one of those candles that crackles as it burns, and it was so lovely to light this on cold winter nights. I wasn’t a massive fan of this scent however, so I probably won’t be repurchasing this. I am happy to have another candle off the shelf and to see that my stash is slowly being whittled down. 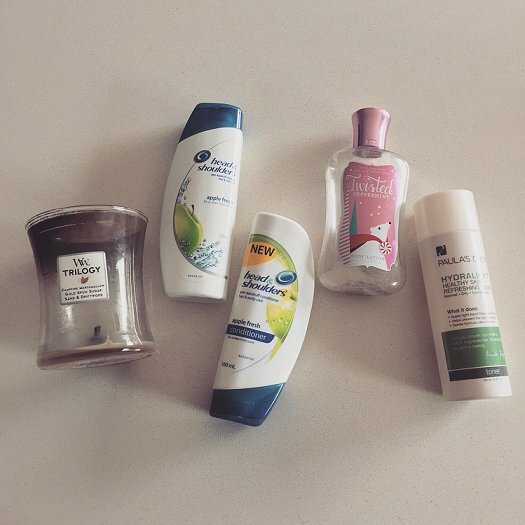 29: Head & Shoulders Shampoo – This is Sebastian’s favourite shampoo, so we go through bottles fairly regularly. I don’t have much to say about this other than it does what it’s supposed to do, and that’s all I can really ask of it. 30: Head & Shoulders Conditioner – I don’t normally buy this to use with the shampoo, but the two came in a set so I figured we might as well give it a go. I don’t remember feeling anything in particular towards this (good or bad), so I assume it did the job well enough. I won’t be repurchasing it though, I’ll stick to the shampoo only from now on. 31: Bath & Body Works Twisted Peppermint Body Lotion – This was the never-ending bottle of lotion, and as much as I love this product I’m so glad to have finally finished it up. Lucky for me (groan) I think I have another couple of bottles of this stashed away in my cupboard from my Bath & Body Works hoarding days. Paula’s Choice Hydralight Cleanser – I haven’t included this in the tally this time around because I repurchased this prior to the bottle running out. If you’ve read any of my posts about skincare before you would know that this is my all-time favourite cleanser. I will keep repurchasing it until it is discontinued. 23: Alterna Caviar Anti-Aging Seasilk Volume Shampoo – I don’t feel like this had any sort of anti-aging impact on my hair (is that even a thing?) and it didn’t seem to add any volume, but having said that I did really like this shampoo. It smelled nice and citrus-y, lathered up well, and left my hair feeling clean and soft. 24: Alterna Caviar Anti-Aging Seasilk Volume Conditioner – This is one of the few times I’ve been able to include both a shampoo and conditioner from a duo in one month’s empties. As with the shampoo, I liked this and would consider repurchasing both if I ever get the urge to splurge on some hair care. 25: Evo Mane Attention Protein Treatment – This is my favourite conditioning treatment. Because I have fine hair (a lot of it), when I use hair treatments I tend to only use them on the bottom half of my hair and this does an amazing job of tending to my frazzled ends. 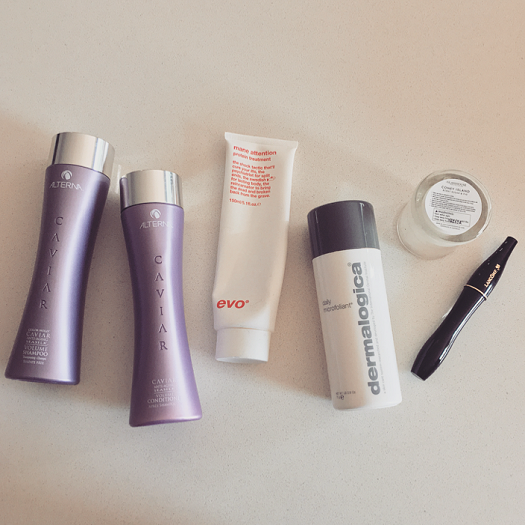 26: Dermalogica Daily Microfoliant – I’m sad that I finished this. Although it’s probably a good thing because I feel like I’ve had this particular tube for so long it’s probably gone past its use by date. This is my favourite manual exfoliant, and I really wish I had another tube stashed away in my cupboard. Alas, I do not, which means I’ll need to use up some other stuff before I’m able to repurchase this. 27: Glasshouse Candle in Coney Island (Burnt Sugar & Fig) – Words cannot describe how much I love the scent of this candle. A LOT. There we go. I will definitely be tracking down a full-sized version of this once I’ve burnt through the candles in my stash. This is one of my favourite scents of all time, and if I could eat this candle I would. Lancome Hypnose Mascara in Noir Black – As you can see I am not including this in the Project Pan tally, because I repurchased it. And I will repurchase it FOREVER as it is my all-time favourite mascara and what I wear on my lashes every single day. 21: L’Oreal Everstrong Strengthening & Repairing Conditioner – I seem to run out of shampoo way before I run out of conditioner, so I always have a few half-empty bottles floating around in the shower. This is one-half of another of my favourite drug store shampoo/conditioner duos, it works really well the frazzled and dry hair that I am living with at the moment. Bobbi Brown Corrector in Porcelain Bisque – As with the NARS Radiant Creamy Concealer mentioned in my previous empties post for July, this is a holy grail product so it’s not being included in the tally because I repurchased before it had even run out. I really like this as an under eye concealer because does a good job of covering my purple circles (cruel genetics). 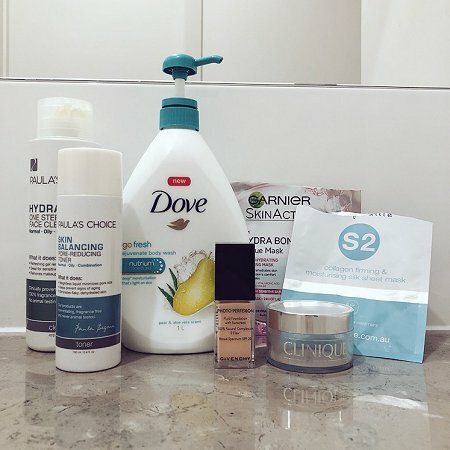 22: Dermalogica Active Moist – When I feel like my skin needs a break from Paula’s Choice or I just feel like using something a bit different, I reach for Dermalogica products. This is one of my all-time favourite facial moisturisers because it feels like it does a really good job of moisturising without being too heavy on my skin. Givenchy Photo Perfexion Foundation in Perfect Ivory – This is another holy grail item that I repurchased as soon as I had finished the bottle up. I’m sure we’re all aware by now that this is my absolute favourite foundation and I would be lost without it. I pray to the Givenchy cosmetics gods that this will not be discontinued. Cetaphil Gentle Skin Cleanser – Another holy grail item that isn’t being included in the Project Pan tally (there seem to be a lot of these lately), and a long-standing favourite in my bathroom cupboard. I use this every day in the shower as a body cleanser, and it’s a product I remain faithful to after many years.